In the wake of the release of the 2013 budget by Rep. Paul Ryan (R-WI), a diverse group of distinguished faith leaders have come together to condemn the budget’s immoral cuts to services aiding the nation’s poor and continued tax breaks for the wealthy and special interests. Below are quotes on the Ryan budget from a range of clergy and religious leaders representing congregations, denominations, and faith-based organizations. Every pastor knows that a budget is both a moral document and a financial document. The Ryan budget would not only cut lifesaving programs for the most vulnerable in our society, but it would also call into question the very moral fiber of this nation. This budget seeks not to expand liberty but to contract it—and, in the process, render null and void the social contract we have signed with our nation’s children and elders. We must write and pass a budget that lives up to the moral identity of our nation, not one that decimates our neighborhoods, despises our poor, and declares that the young and old of this country are on their own. Last year we “Nuns on the Bus” traveled thousands of miles to connect directly with communities where the devastating effects of Rep. Paul Ryan’s 2012 budget proposal would be felt. We had already strongly protested his budget cuts since it was clear they would harm already struggling families. During our journey we listened to the personal stories of those families and our hearts were deeply touched. Today we are convinced more than ever that the voices of the people must be heard and that Rep. Ryan’s cuts to vital human-needs programs to benefit the wealthy must be defeated. We are a nation for the 100 percent, and his budget cuts are both immoral and counter to our values. The House Republican budget cuts away at vital social services that affect the poor and those who are barely able to meet the basic needs of their families. Our national budget reflects our core moral values and we will not recover economically until we address our unjust approach to budgeting. People living on the economic margins must be treated with care and dignity if we are to ever hope to have a just and effective national budget. Our representatives in the House and Senate are elected, inaugurated, and anointed to the sacred responsibility of serving the common good through public office. As leaders of diverse faith communities, we urge them to protect the “least among us”—the children, the infirm, the poor, and the vulnerable. Members of our congregations depend upon our chosen representatives to hear their cries of suffering and to work collaboratively to pass a Moral Budget. May it reflect the highest values and priorities of family, community, state, and a just society. Across traditions and cultures, people of faith are commanded to care for the poor and vulnerable among us. In the United States today, this means more than 32 million children who live in poor or low-income households. Our federal budget should fight the evil of childhood poverty by funding programs like food stamps, housing assistance, child care, and Medicaid at levels that children need to grow up healthy and strong. If the House Republican budget fails to care for our children, then it fails one of the greatest moral tests that God has given to faithful people. We look to our elected leaders to provide for the “common good” for all, including the most poor and vulnerable among us and we ask that our political parties support a budget that passes a “basic moral test.” Will it help lift up those most in need and help them to get out of poverty? We urge action against the House Republican budget as one of moral necessity. We must ensure that all individuals and families have access to the care they need throughout their lives regardless of their economic status and social condition. Budget cuts that fall hardest on the working poor are simply irresponsible and immoral. I applaud Rep. Ryan’s interest in Catholic teaching, but it’s impossible to reconcile that concern with his budget proposals that would decimate vital social safety nets that Catholic leaders helped create and defend today. A lot of people are talking about the “generational theft” inherent in an unsustainable budget deficit, and this is indeed a needed discussion. But too few are talking about “demographic theft,” by which the wealthiest people at the top of the pyramid own a larger and larger share of wealth, leaving the poorest among us with next to nothing. We must oppose all proposed solutions to “generational theft” that aid and abet “demographic theft,” and a good way to start is by guaranteeing, from the start, the most protection for the most vulnerable. 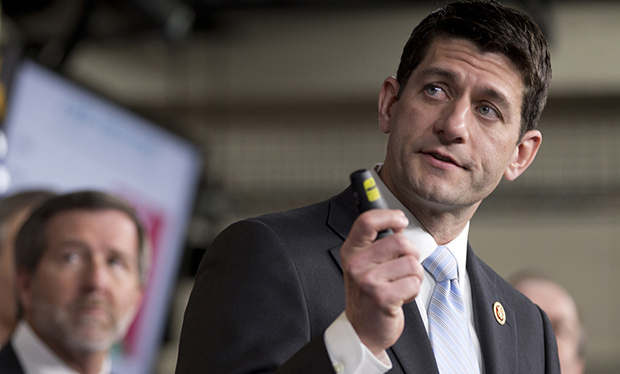 Rep. Paul Ryan returns with yet another hard-hearted and shortsighted budget. This radical rejection of our government’s obligations to the common good denies our young workers Medicare’s guarantee of coverage in old age and sacrifices the most vulnerable to preserve unsustainable tax cuts for the wealthiest few. Rep. Ryan’s libertarian ideology would make Ayn Rand proud, but can never be justified by Catholic teaching or Gospel values. This budget, if pursued and passed, will send a message, in both tone and tactic, that our government is more concerned with protecting those who control wealth and privilege than supporting those upon whom that wealth and privilege has been built. As a person of faith, as a citizen of the United States, and as a human being, this is simply unacceptable and I urge Congress to reject Rep. Ryan’s budget. Every world religion describes a God who will judge us by the way we treat the most vulnerable among us. The prophets of the Jewish scriptures, and certainly Jesus, would have much to say about the impending cuts to the most vulnerable brought on by the Ryan budget. And it wouldn’t be pretty! People of faith need to stand up to a Congress that would “save” the economy on the backs of the poor, the disabled, and the vulnerable. This document is a joint product of the Half in Ten Education Fund, the Faith and Progressive Policy Initiative, and Faith in Public Life.